LITTLEST PET SHOP: Pet Shop Pals Go Adorable on DVD! The cutie pets are back! From Shout! 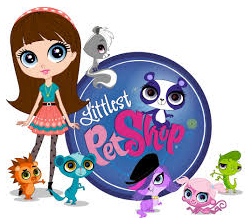 Kids Factory and Hasbro Studios comes the DVD this week of LITTLEST PET SHOP: Pet Shop Pals. Blythe and her very best friends – Zoe the spaniel, Pepper the skunk, Sunil the mongoose, Russell the hedgehog, Penny the Panda, Minka the monkey and Buttercream the Bunny are back for five more exciting adventures! Once again everyone gets a chance to meet some new friends, like a shy tortoise, a spying cat, a famous comedian orangutan and Pepper’s new crush. Who could it be? Find out with Blythe and the gang! FINAL WORD: Every moment there is something to love about the gang at the Littlest Pet Shop. It is easy to see how it has become such a hit, especially with young girls. It is fun, funny and easy for everyone to enjoy. SHOUT! Kids Factory brings the best to fans offering up feature films, classic television series, animation and specials. For more of what they have to offer go to HYPERLINK “http://www.shoutfactory.com” www.shoutfactory.com. TUBS OF POPCORN: I give LITTLEST PET SHOP: Pet Shop Pals four tubs of popcorn out of five. Once again there is so much here to enjoy and appreciate – from the animation and characters to trusting Shout! Kids Factory and Hasbro Studios to bring us a series that has so much heart. The DVD includes Books and Covers, Helicopter Dad, Lotsa Luck, The Nest Hats Craze and Sweet Pepper. There is also a Bonus Feature Sing-Along which is so much fun. My granddaughter absolutely loves LITTLEST PET SHOP and is the one responsible for introducing me. What I love the most about it is the vivid colors, the adorable and hilarious characters yet a continual storyline that plays out beautifully. That is absolutely the best part of watching LITTLEST PET SHOP. The theme of friendship, loyalty, acceptance and all the things every Mom and Dad want their children to learn. What an amazing way for parents to get a boost up with that because I sure listen when the gang speaks. In the end – the pet shop pals are here!